It seems that VMWare are getting rid of VUM (I assume something new will be released soon to replace it), so more and more people are going to need to manage ESXi upgrades from the command line. I suspect that the people that will be most affected by this are people running the free version of ESXi. 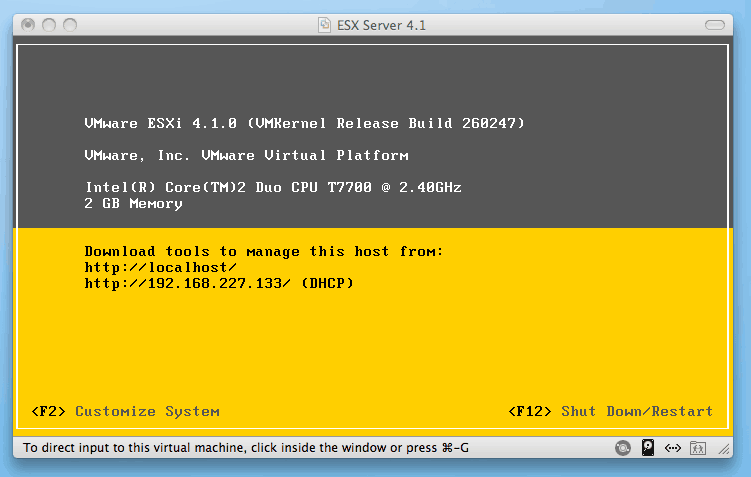 Anyway, here is a quick how to, for ESXi upgrades. Note – you can also adjust the tech support timeout here – so you could limit how long tech support stays enabled for. Place the file upgrade-from-ESXi4.0-to-4.1.0-0.0.260247-release.zip at the root directory of your web server. VMotion all the VMs off of you host, or Shut down all VMs, and put the host into maintenance mode. The zip file will be downloaded from your web server and installed. Reboot the ESXi server when prompted. If you do not have a web server handy, you could copy the bundle locally on the ESXi host. – or even on a shared datastore accessed by multiple ESXi hosts if you have shared storage. Reboot the host when done. Once that’s complete, take the host back out of maintenance mode, and power on the virtual machines. You’ll possibly have new VMtools available, so upgrade these. If your host refuses to start up and you are having issues, you should be able to revert to your previous installation by hitting Shift-R as the host boots up. 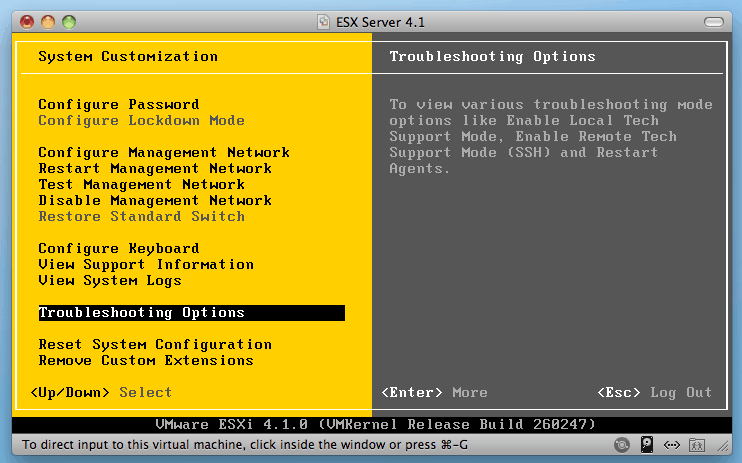 ‘Upgrading’ from VMWare ESX 4.0 to ESXi 4.1(u1) – with as few button clicks as possible. Anyone reading the official docs from VMware at : http://www.vmware.com/products/vsphere/esxi-and-esx/upgrade.html#c177045 is likely to be annoyed and frustrated at the lack of actual information as to how to manage the ‘upgrade’ (migration) from ESX to ESXi. We all know that at VMWolrd 2010, VMware announced that we are on our last Major release of ESX. Anyway, we have about 80 ESX hosts to migrate to ESXi, so I decided to find the easiest method to do so. A scour of the web found several great resources. – and some valuable information. It seems that nobody has yet delivered a full ‘upgrade’ solution, but several people have provided automated deployments of the core installation and several other people have created configuration scripts for the newly installed ESX. So I have decided to add an additional ‘information gathering’ step, then ‘borrow’ some of the work done elsewhere and put together an ‘upgrade’ solution. Scratching my head, I have been working on a simpler way to manage the deployment / upgrade. I will not recreate any posts that already exist to deploy any existing methods, though will highlight any tweaks I have found to make these smoother / easier and identify my preferred source for deployment. 3) Deploy captured config to our new ESXi host. Whilst I realise that this probably will not be enough to make it a full ‘upgrade’ the idea is to get as much done as quickly as possible. Coming up will be several posts, documenting comparisons of 6 methods of deployment, as well as some PowerCli code and a look into Host Profiles for easing this process. On the off chance that one of the vendors that do ‘migration’ tools feel like offering me a free license to trial their tool and write up a process doc, I may even be inclined to review that for people with $$$ – but it is important that it is noted that I promise no allegiance to any tools, as would like this review to be fair and open to all. The end product of the series should provide a decision as to my preferred FREE method for doing the migration. At the end of the series, I’ll create a comparison table comparing the various products, as a springboard for anyone who’ll soon be in the same situation as me. All tests for now will be run in my isolated lab, with the convenient luxury of the deployment servers being located on the same subnets etc as the Hosts I’ll be deploying to, but once I have selected a solution and start the migration of 80 ESX hosts to ESXi, I will of course post details of any further tweaks required for deployment.